At the staff wanaanga in May health promoter, Leanne Matuku momentarily confused her colleagues when she asked for a strong volunteer to come to the stage and lift her colleague Carla. A reluctant Trent Martin stepped forward and after some toing and froing Carla was being piggy backed. The point Leanne was making was a reference to a client she had been working with over the previous year, Leeanna Pue. Leeana, now 34, has been obese for most of her life. She has been seeing dieticians since she was five years old, she suffers from asthma, high blood pressure and has a heart condition. Some 15 months ago, tipping the scales at 212 kilograms, and almost too big to drive her car, she started taking part in Fit4Life*. At the point of the wanaanga Leeana had lost 61 kilos – or roughly the same weight as Carla. Four months later and Leeana is now 78 kilos lighter than when she started on her journey to regain her health, and her life. Her aim is to get to 100 kilos, or less, by Christmas. Leeana describes how she got to the point where she couldn’t walk, stand up or even put her socks on without difficulty. Getting a ride in someone else’s car sometimes wasn’t possible if it wasn’t a big car. She had to carry a letter from the Ministry of Transport explaining that she was exempt from wearing a seatbelt on account of her size, and her asthma was getting worse all the time. Leeana visited her GP hoping to be recommended for a gastric bypass. She was told she was too big for the procedure and would have to lose weight to be considered. Whānau members had told her about Fit4Life but Leeana was sceptical, at least, until she tried it. 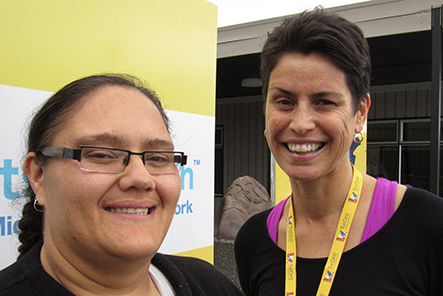 Leanne Matuku (pictured below on right) started working with Leeana and her whānau. She would visit them at Leeana’s workplace – the Nga Pekanga Kohanga Reo in Waitara, twice a week and they would work out for 45 minutes, increasing the intensity as Leeana’s fitness improved. Starting out Leeana couldn’t do many of the exercises Leanne was teaching but together they would modify the movements so that push ups were done standing up, pushing away from the wall. As the weight began to fall off Leeana’s mobility increased. To illustrate the point, she drops to the floor to demonstrate how to do a sit up that works the core by folding herself into a V.
When it came to diet Leeana realised that small changes were the way to go. She cut down on bread and carbs and started making healthier choices, cutting out fizzy drinks and eating less fried food. Keeping a food diary has helped her stay on track. Leeana, supported by other members of her whānau, also started going to a gym, Rampage in Bell Block. Leeana is evangelical about the changes Fit4Life and regular exercise has made in her life. A healthy rivalry among other whānau members has led to a competition to see who can lose the most weight. Leeana is winning. Leeana believes that if she has been able to lose weight then anyone can. She is helping other whānau members to follow suit and some of them are. Last Christmas when the Pue whānau went to Hamilton to celebrate Leeana overhauled the menu to ensure that there were healthy options available, as well as treats. Each day there was exercise and activity worked into the plan. Sports like cricket or swimming made it fun for the kids and even Leeana’s aunties were all out walking and doing sit ups. “Since I’ve started to get healthier I’ve really come out of my shell. Because of my size I just didn’t have the energy to socialise before. Now I’m making friends at the gym and enjoying myself more. *Fit4Life is both a healthy eating and physical activity plan that runs over a period of six weeks. The programme targets Maori and Pasifika groups but works with a variety of different people.